With the release of the Cayenne in 2003, Porsche paved the market for high-powered luxury SUVs. We have since seen competing SUVs from Audi, BMW, Mercedes-Benz, Bentley, Maserati, Land Rover, and of course Jaguar. One can’t help but speculate that the other European manufacturers skipped the innovation step and are simply jumping on bandwagon. And why wouldn’t they? The Cayenne and Macan rolling out of the German automaker’s factory accounted for 68% of their sales in 2015. Porsche successfully broadened their market position whilst maintaining their DNA. 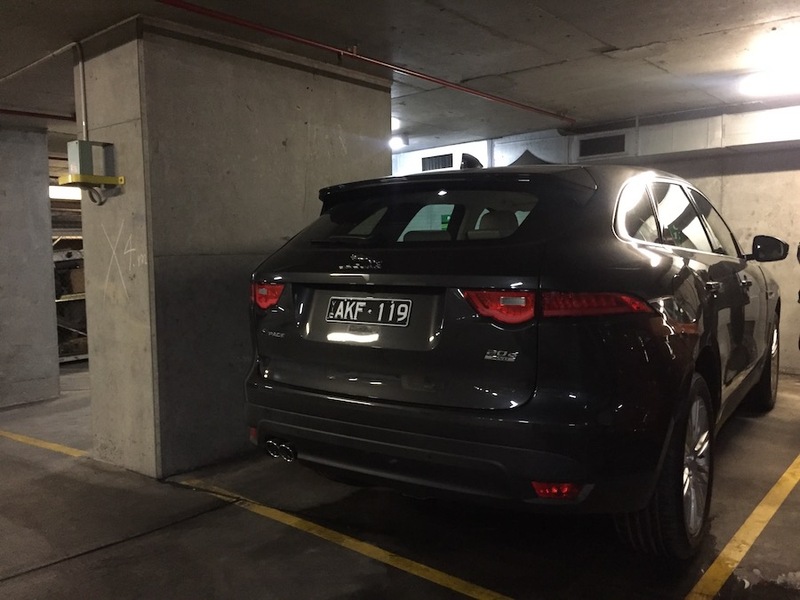 Back to the Europcar F-Pace. 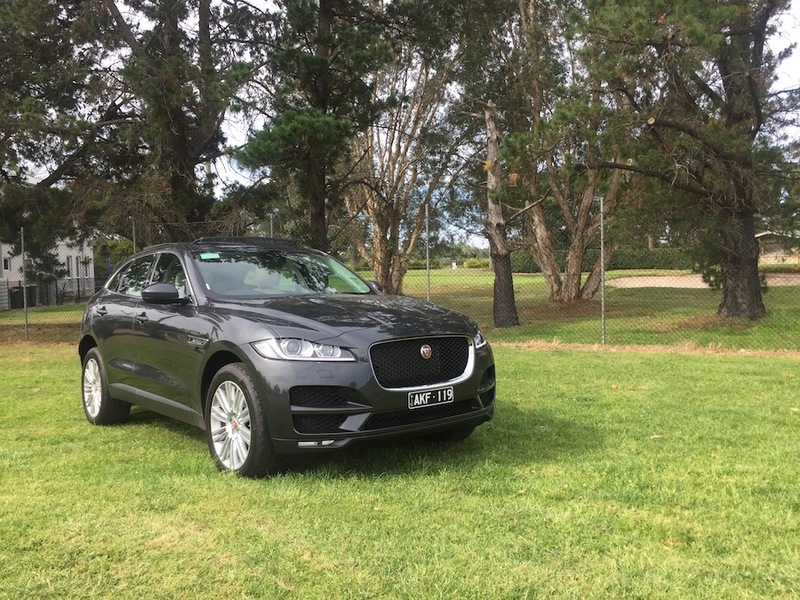 It was only by chance that I stumbled upon Europcar releasing the F-Pace for hire in Australia. Avid RideHacks readers would recognise that I have a soft spot for Europcar despite prices significantly higher than Hertz. 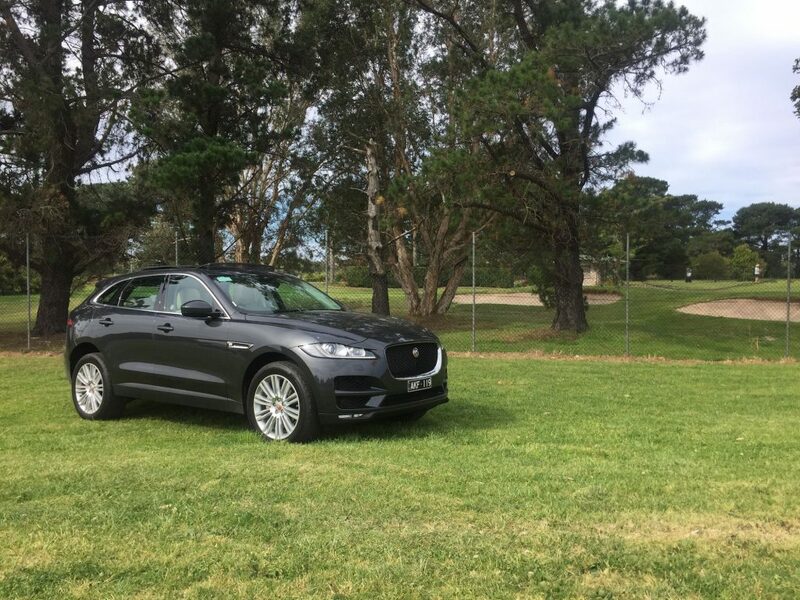 When I saw they were introducing the Jaguar F-Pace in the first week of October, I decided to make a reservation as the first Australian to drive the first ever Jag offered by a major rental company. The timing couldn’t be better for Europcar. Where their Mercedes-Benz GLE250 is in response to Audi Q7 you can find at Hertz, the F-Pace is a direct competitor to their new Audi SQ5 introduced only last month. Which is better? Let’s find out. Not too much to mention here. It was vanilla Europcar service — fair, easy, quick. As expected, they wanted me to take the extra insurance, I left the $8k excess on the table and declined. I’ve never had any complaints about the Europcar service and appreciate the chitter-chatter during the handover process. One thing to note is that the staff in the city locations are always far easier to work with than the Airport. I get it. They get a lot of clueless tourists and needy executives who need special attention at the airport. If you can Uber to the city and pickup a car later, save your airport tax and book from the city. The F-Pace has presence. You’ll notice this as you approach from any angle with your keys in hand. Notable aesthetics include the combination of signature Jaguar curves, aggressive lines, a gaping air intake, and the huge engine bay. Such characteristics separates it from cars with softer lines such as the Audi SQ5 and Cayenne. 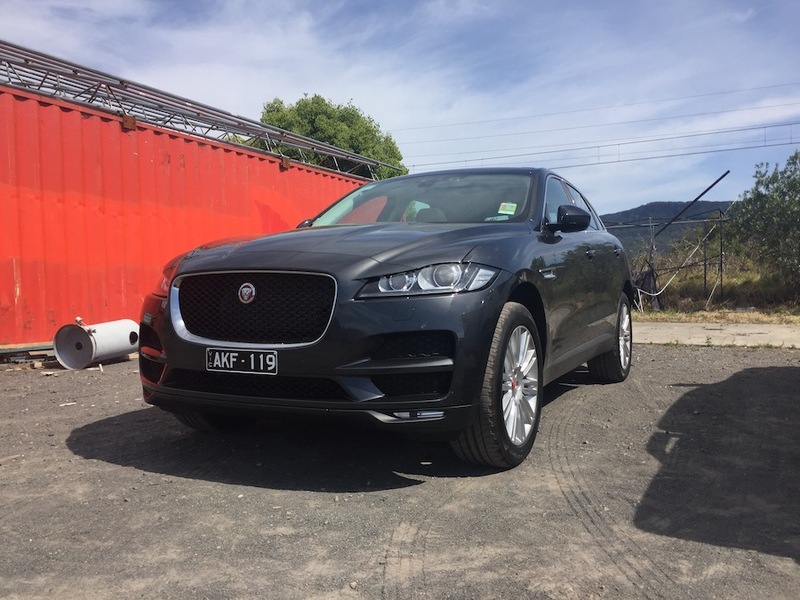 Walking up to the Europcar F-Pace doesn’t feel like you’re getting into a regular rental car. 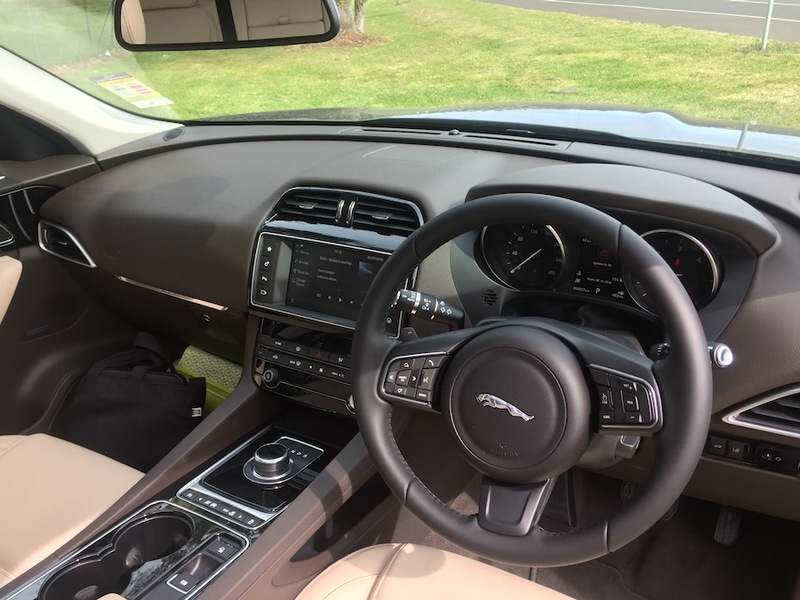 Hopping inside (it’s higher than one would expect from a Jag), the interior feels very similar to the Land Rover Discovery Sport and the Range Rover Evoque. It didn’t feel worthy of being compared to a genuine Range Rover, although it’s somewhere around 30% of the price. I must say, I had ulterior motives for hiring the Jaguar F-Pace from Europcar. 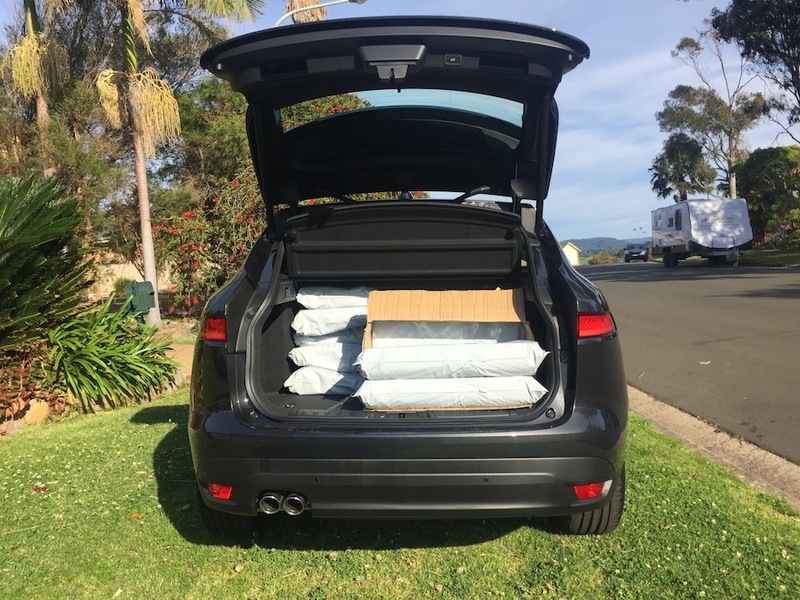 A few months ago I purchased a Luxury Pillow Brand and needed to move some pillows I stored as part of the transfer. 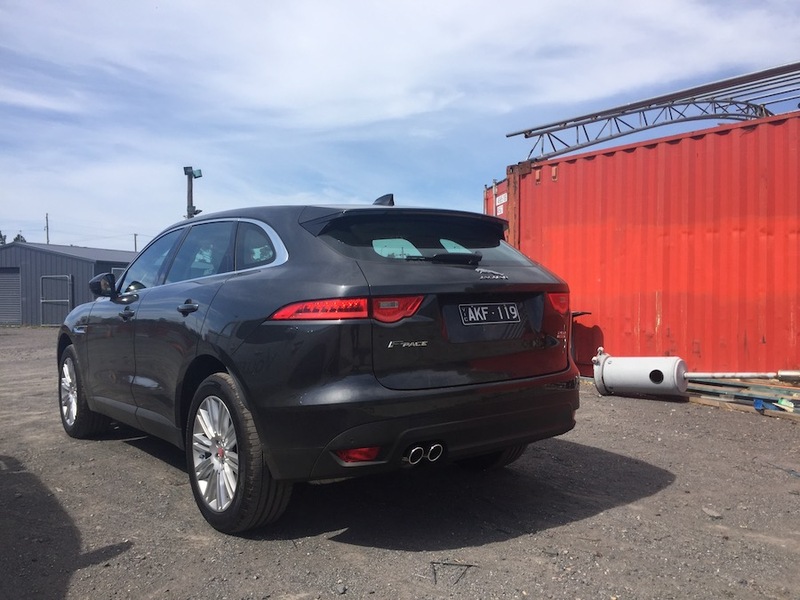 Whilst I can’t imagine the designers at Jaguar ever planning for the F-Pace to actually haul cargo, I put it to the test. Actually, it wasn’t much of a test. The cargo room is more than adequate for a medium-sized SUV and the extra weight was negligible to speak of performance. True to the form of a rental company, Europcar purchased the cheapest possible F-Pace available — the 20d Prestige. This is a 2.0L diesel paired with a smooth eight-speed automatic. That is, smooth until you are quickly asking it to change down gears in dynamic mode – I’m yet to find a diesel that can execute this change smoothly. Packed under the oversized hood, presumably big enough for the top-dog 280kW and 450Nm Supercharged Petrol V6, you’ll find an adequate 132kW/430Nm diesel forked from the brother Land Rover’s factory. It seems that the engine is shared with the Range Rover Evoque TDi, however the RR has a 9-speed transmission and presumably more off-road capability than the F-Pace. Presumably. I would have preferred to see Europcar launch the F-Pace 30d V6 diesel that pushes out 221kW and 700Nm, surpassing their Mercedes-Benz GLE250 (150kW/500Nm) and head-to-head with Hertz’s Audi SQ5 (240kW/650Nm) with power-to-weight only 3.5% greater from the F-Pace 30d. Alas, Europcar chose the profitable option. From this point it’s easy to figure that the F-Pace isn’t going to be anywhere near a rival for Hertz’ Audi SQ5 when it comes to driving performance and experience. With 45% less power and 33% less torque, it’s just not a fair comparison. As you can imagine, the drive isn’t as exciting as you would expect from a Jaguar, and the handling suggests that you will never push the limit in the 2.0L Prestige model. It’s a neat package, but wasn’t exciting enough for me to tell stories other than being the first person to rent it in Australia. The interior felt much like the Land Rover Discovery Sport I drove earlier in the year. With the refinement of the finer trim details, it felt less like an SUV after you begin driving. The controls and infotainment are relatively simple to setup and learn as you drive, and the standard technology features of this price-point are at your fingertips. You can read up the auto-magazine reviews for more details here. A day with the F-Pace will cost you somewhere around $260 all inclusive per day. It’s not cheap. I personally value the experience about $100 less and would likely rent it several times per year for $160 per day. However I don’t regret giving it a try. The car seems to be designed for long-time Jaguar lovers who need a second Jag as a family car. As a rental car, it belongs in the category of a unique premium SUV experience. It’s not worthy of being called a true driving experience with the current engine configuration, and would be an expensive way to ‘try a Jag’. On the other hand, it could be an ideal ‘test drive’ if you were considering buying one and didn’t want the salesman talking to you the entire time. My suggestion: grab this car when going somewhere with two or more people sharing the driving. Everyone will enjoy the novelty of driving an oversized Jag and you can split the expensive price tag. Fancy driving the Jaquar F-Pace SUV?